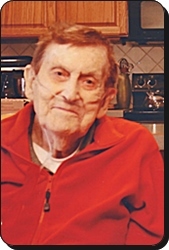 Vernon E. Warner, age 96, of Grand Rapids, went to be with his Lord on Monday, June 25, 2018. Vernon proudly served in the U.S. Army during WWII. His wife, Theresa, preceded him in death. He will be lovingly remembered by his daughters, Terri (Karl) Keizer, Melinda (Torben) Drewes; grandchildren and great grandchildren, Karl Jr. (April) Keizer (Mitchell, Troy), Scott Keizer, Jennifer (Jamie) McKeiver (Brooklyn, Timothy), Matthew Drewes (Ava), and Rebecca Drewes. Visitation will be held on Tuesday, June 26, from 6 - 8 pm at Stroo Funeral Home. The funeral service will be held 11 am Wednesday, June 27, at Unity Reformed Church, 4450 Poinsettia SE, with Rev. Mark Bergsma officiating. There will be an hour of visitation from 10 - 11 am prior to the service at the church. Interment will be in Chapel Hill Memorial Gardens. I'll miss Vern and his wit. His presence will also be missed in Unity Reformed Church.